Size: 22.5 x 28.5 x 2.5"
22.5 x 28.5 x 2.5"
14.5 x 18.5 x 2.5"
24.5 x 30.5 x 2.5"
30.5 x 40.5 x 2.5"
Store, protect and transport your valuable art work, prints, documents and more with the black with white lining 22.5 x 28.5 x 2.5" Solander Museum Case from Archival Methods. This case holds up to 24 4/2 ply, 19 4/4 ply, or 34 2/2 ply window/mats. For confident stacking, this strong case is constructed with low-resin basswood sides and spine, and a black, acrylic-coated cloth exterior. The interior lining is acid and lignin-free card stock. The hinged, lay-flat design provides easy-access to contents. Users will appreciate the latch closure, nickel-plated hardware, and metal, 3 x 1.25" label holder. 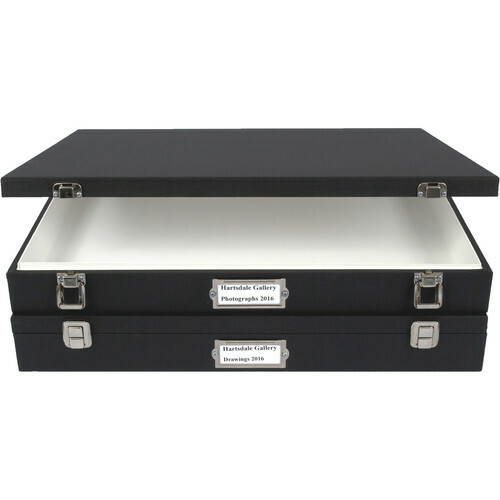 Box Dimensions (LxWxH) 30.0 x 24.0 x 3.0"
Solander Museum Case (22.5 x 28.5 x 2.5" - Black with White Lining) is rated 5.0 out of 5 by 1. Rated 5 out of 5 by Architect FAIA from Very High Quality Case - The Gold Standard The case is the finest available and is extremely well designed. It is beautiful. It is well crafted although mine had a lid that was ever so slightly out of alignment with the base of it. Overall I am extremely pleased and I found it to be fine value.